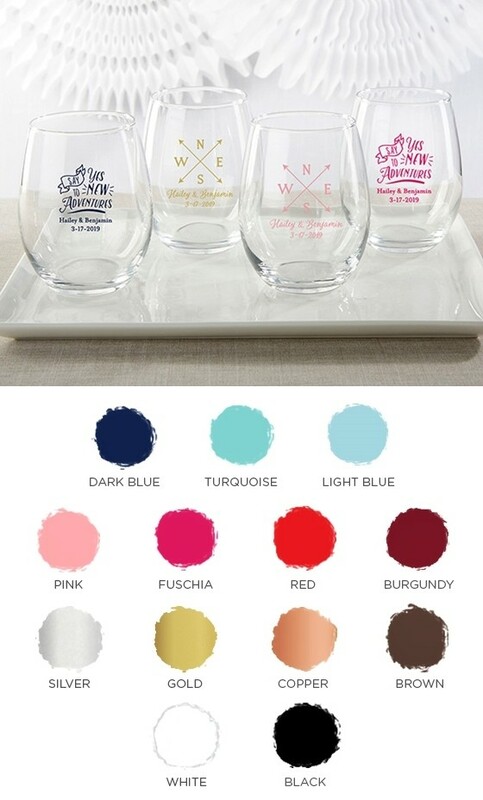 Offer a favor your guests will really enjoy on your special day with these sophisticated stemless wine glasses available in your choice of two "Travel & Aventure" designs with your custom text in your choice of 13 ink colors. PLEASE NOTE: Hand wash recommended. Display gift-boxes are not included but are available for an additional fee. The minimum quantity for this item is 36 (and all must have the same design and text). Please also note that while we package all personalized glassware with extra care, we cannot replace any glassware that may break while being shipped by UPS or FedEx. It's always a good idea to order extra quantity (5% is the rule of thumb) to account for shipping damage or unexpected guests. Due to personalization, there is a design setup fee of $39.00 that will be added to your order at checkout.